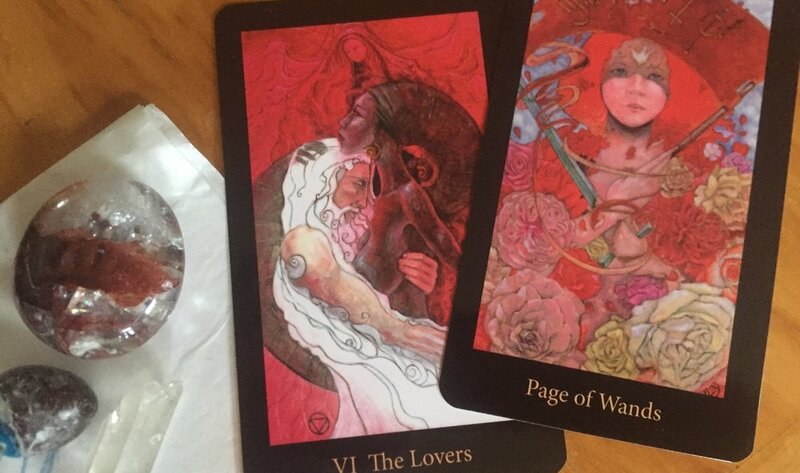 When I pulled these cards, all I could think of was: “commit with full heart and honor the energies of the seeds—with all their potential—as they lie down and wait for the right time to come…to bloom and radiate.” (Ref: The Hanged Man.) And this “seed” could be you…your seed…your soul…your truth and beauty. It’s as if in a fairy tale—one in which the hero or heroine (or something or such) rises up against all odds, gathers wit, will and wisdom, and soars with all fire, beauty and radiant strength. Are you the hero of this story? Cards from the Mary El Tarot by Marie White.